On my day off, I helped some friends harvest olives in Varano, Ancona, Italy. The entire harvest is done by hand. First, we spread fine nets on the ground under the trees, and then branches were cut down and we picked olives off the branches on the ground, or we climbed ladders and combed the trees with small plastic rakes. 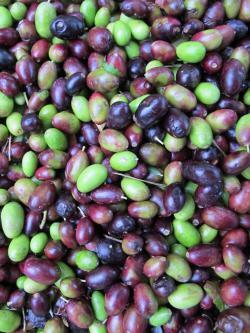 Olives yield about 15% of their weight. 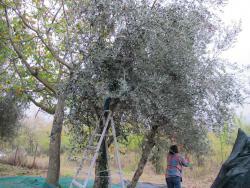 We harvested 80KG or about 176 pounds of olives. This means the farmer will get about 26.4 pounds or 35 12-ounce bottles of oil from the harvest. All olives--green, brown, and black--are harvested. When a guy talks about White and Yellow Bears in Minnesota in 1823, what exactly does he mean? That’s the question I started asking last week after revisiting Giacomo Beltrami’s narrative, "A Pilgrimage in Europe and America V2: Leading to the Discovery of the Sources of the Mississippi and Bloody River", where he mentions “white bears” in Northern Minnesota. Surely he’s not referencing polar bears. Perhaps albino black bears? “The white bear is the only wild beast of these regions that is dangerous." "I then carefully put my gun in order, to be able to defend myself against the attack of white bears, which abound near the Red River." The shades and colors of grizzly bear (Ursus arctos horribilis ) fur are as varied as human hair, ranging from dark brown to white. 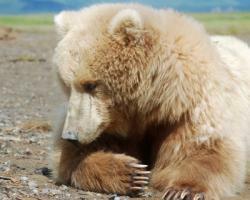 In fact, white grizzlies (not albinos) are not uncommon in portions of Alberta and Montana, and in south-central British Columbia. “Goodrich and Willard visited the indian [sic] Village this morning and returned in the evening Willard brought with him the dressed Skin of a bear which he had purchased for me. this Skin was of a uniform pale redish[sic] brown colour, the indians[sic] inform us that it was not the Hoh-host or white bear, that it was the Yâck-kâh this distinction of the Indians induced us to make further enquiry relative to their oppinions [sic] of the defferent [sic] Species of bear in this country. We produced the Several Skins of the bear which our hunters had killed at this place and one very nearly white which Capt Lewis had purchased. the White, the deep and pale red grizzle, the dark brown grizzle, and all those that had the extremities of the hair of a White or frosty Colour without reguard [sic] to the Colour of the ground of the poil, [sic] they designated Hoh-host and assured us that they were the Same with the White bear, that they associated together, were very vicisious, [sic] never climb the trees, and had much longer nails than the others." So, it appears for the Beltrami text, “white bears” are grizzlies. During his three months in Minnesota in 1823, Beltrami’s main method for staying warm was the “white bear robe” he procured from an Ojibwe person. To date, there aren’t any indications the bear robe survived in the Beltrami Museum collections here in Italy, but I’ll keep searching. Leonard Wabasha, David Mather and I all decided this linguistic information gives a whole new interpretation to White Bear Lake, MN, a town that is associated with the legend of star-crossed Ojibwe and Dakota lovers being attacked by a “white bear”. The town’s logo is—you guessed it— a polar bear. There is a rare white color phase of the American black bear. John Tanner reports seeing one on the Canadian/Minnesota border in the early 19th century. The Kermode bear, or “Spirit Bear” is a white bear and a sub-species to the American Black Bear. Sometime on or around October 31st, the world's population will hit seven billion people. That's all fascinating and all, but...what about me? Luckily, the BBC has come to the rescue with a lovely little interactive that's, well, all about me. Or you. Whatever. At the time of my birth, I was the 3,840,942,641st person to live on Earth. And the 78,068,048,685th person to live since history began. To give you a sense of just how fast our population is growing, here's a crazy little fact: by mid-century, the world's urban population will equal the size of the world's global population in 2004. Wow. Cities are efficient, and concentrate us so that we can use land for other purposes, but they're also ecological hotspots. Curious about how your household measures up? Try the household flux calculator, or check out the Q&A with Scientist on the Spot Daniel Nidzgorski. Not enough for you? Check out "Seven billion in seven stories" and "Will people numbers keep rising?" Oh, and let us know: #whatsyournumber ? Danse Macabre: Artwork Inspired by the Black Plague.Courtesy Wikimedia Creative CommonsHalloween is coming up soon and what better way to scare the tar out of everybody than with another Black Plague story. In the 14th century (1347-1351) the the plague devastated much of Europe. It was brought on by the bacterium Yersinia pestis and thought to have originated in China. Rats, infested with fleas carrying the bacteria, spread the fatal pathogen via the trade routes and across Europe, wiping out one-third of the human population. This is a conservative estimate; some claim as much as 60 percent of the population was eradicated! The Black Plague was the second of three great waves of plague that raged across Europe during historical times. The first, known historically as the Plague of Justinian, took place in the 6th century and affected the Byzantine Empire and much of Europe. The last major wave, known as the Great Plague of London, killed about 100,000 of the city’s population in 1664-65. In the two centuries that followed, waves after wave of the plague continued to devastate the European population although on a lesser scale. These outbreaks although sometimes as virulent, were often more isolated regionally or within a city and kept Europe’s population from rebounding for a good century and a half. The plague presents itself in three ways: bubonic, septicemic, and pneumonic. All three infections are caused by Y. pestis. With bubonic plague, the lymph nodes become painfully swollen into what are termed buboes – hence the name bubonic. Scepticemic plague, the rarest of the three forms, infects the blood. Both bubonic and scepticemic, if left untreated, result in death between 3-7 days after infection. Pneumonic is the most contagious since it infects the lungs and is easily spread through the air in a spray of water droplets. It’s also the most lethal and usually kills its victims in one to three days. Each form can present itself on its own or can progress into all three. It’s thought the Black Plague was mainly a combination of the bubonic and pneumonic forms. (The practice still used today of saying, “Bless you” after someone sneezes is a holdover from the 14th century plague) The only defense against the pandemic was avoidance of fleas and the fatally sick. Not easy to pull off when rats and the afflicted were widespread. Infected families were generally quarantined, their houses marked with a red cross, and left to fend for themselves. 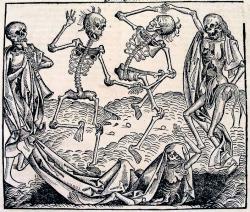 The plague had a tremendous effect on European life in the Middle Ages. The Hundred Years’ War actually paused briefly in 1348 for lack of soldiers. The plague had wiped out too many of them. Economically, wages rose sharply because the workforce was also greatly reduced. Shop owners suffered because no one dared step outside the confines of their own homes, so supplies rose and prices dropped. The removal of the rotting corpses required relatives either doing it themselves and further risking infection, or paying premium prices for some other poor schlub to do it. The dead were buried as quickly as possible, often in mass graves. So, that means the very same nasty contagion – the one that terrorized and devastated so much of Europe for so many centuries in the Middle Ages - is still with us today. Luckily, the bubonic plague can be held at bay with antibodies if treated in time. But what happens if Yersinia pestis mutates into a strain against which current antibodies are useless? If that doesn’t make the hair on the back of your neck stand on end, I don’t know what will. Nifty Black Death quiz – thanks Liza! Painted Bison Hide, Dakota, in the collection of Museo di Scienze Naturali Encirco Caffi, Bergamo ItalyCourtesy Museo di Scienze Naturali Encirco Caffi, Bergamo ItalyIf contemporary star quilts and painted bison hides are rooted in the same tradition, that means women were (and still are!) important producers of ceremonially painted arts in Dakota communities in 1823. Ethnographic accounts prior to the 1970s often left women out of the picture regarding the production of art. Specifically, western anthropologists suggested ceremonial and “high” art was the work of men, when in fact women were the primary tanners and painters of hides. Patricia Albers and Beatrice Medicine edited an important volume, "The Hidden Half, Studies of Plains Indian Women" in 1983. One article discusses the development of star quilts from hide painting traditions. This isn’t a new story—centuries-old forms and designs are adapted according to new materials, tools, and ideas—however, this dialogue is helping me consider the two painted bison hides and the importance of women in the Beltrami story. 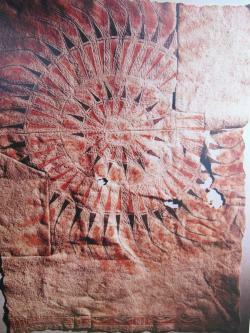 Designs on the Beltrami painted hides consist of radiating concentric circles, sometimes called headdress, sun, or star designs. Contemporary star quilts usually employ an 8-pointed star motif. According to ethnologies and Dakota oral histories, the 8-pointed star represents Venus, or the Morning Star and carries various meanings including immortality and death. Red painted bison hides historically wrapped the dead, and Dakota people still use star quilts during funerals. Today, people gift star quilts to denote passages in life like marriage and the birth of a child, and to honor a person. Are the two traditions related? Why did Beltrami receive two painted hides? What do you think? Would you trust your life to a red umbrella? Back in 1823, Italian explorer Giacomo Beltrami did. 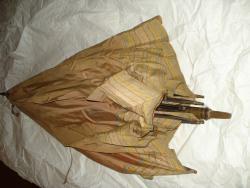 Before famous explorers like George Catlin (1830), Seth Eastman (1830), and Nathan Sturges Jarvis (1833) visited Minnesota and assembled cultural and artistic collections relating to Minnesota’s indigenous people, Giacomo Costantino Beltrami navigated the Mississippi River—mostly solo and protected primarily by a red silk umbrella. Beltrami’s reasoning—correctly it turns out—was the red umbrella would be so exotic he would not be mistaken as a tribal member to the warring Dakota and Ojibwe nations. Beltrami tagged along on the official US reconnaissance mission to map the "Northwest" (currently the state of Minnesota). Beltrami and Maj. Stephen J. Long disagreed during the journey, and in Pembina they parted ways. Beltrami took off with three Ojibwe guides in a birchbark canoe to search for the source of the Mississippi River--his goal all along. Within five days they'd been ambushed by neighboring Dakota Indians, one of the Ojibwes was wounded, and they were running out of supplies. The Ojibwe guides tried to convince Beltrami to walk to Red Lake with them, but he refused to leave his canoe and his collections. So there Beltrami sat alone, a foreigner in the wilderness with a canoe, a rifle, and a red umbrella. Unable to master paddling solo, he dragged the canoe after him with a tow line and propped the umbrella in the bow--basically to make onlookers curious before they shot at him. Why is this story relevant to science? Beltrami wasn't just an explorer, he was a collector. He amassed over 100 American Indian objects through diplomacy, exchanges, barter, and purchases. 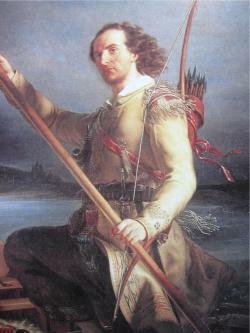 He consciously and thoroughly documented where he purchased the pieces and whom he purchased them from, leaving us with a rare resource that has the potential to expand our understanding of the cultural exchanges and personal interactions that occurred between Beltrami and Minnesota’s Indigenous people in 1823. This 188 year-old ethnographic collection is the basis for my research for the next year. Stay tuned to Science Buzz for more research findings. Oh, and that red umbrella? It's in the collection too! The Route: We will be entering at entry point #16 Moose/Portage River and exiting at entry point #43 Bower Trout Lake. The route was designed to expose us to a wide range of use areas within the BWCAW.Courtesy The Great Pack OutIn honor of National Public Lands Day (9/24/2011), my brother and I are going to spend two weeks paddling over 120 miles across the Boundary Waters Canoe Area Wilderness (BWCAW) documenting and collecting all the trash that we find. My brother and I have been paddling in the BWCAW for 23 years and over the last few years have noticed an increase in the amount of garbage we encounter on portages and at campsites. So we started wondering how much trash is actually out there. 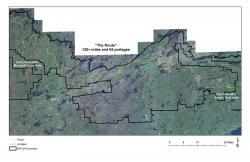 Is it isolated to the highly used areas near the edges or endemic to the entire BWCAW? In doing some research on the wilderness we discovered that the BWCAW comprises less then 1% of the U.S. National Wilderness Areas yet receives greater then 10% of the recreational activity. What effect does this recreational density have on the quality of the wilderness? No one really knows. Studies have not been completed. That’s why my brother and I have decided to check it out. We are going to paddle the BWCAW from west to east documenting, collecting, and packing out all the trash we encounter along the way. We will inventory and catalog everything we find and create trash density maps to aid wilderness resource managers focus education and clean up efforts. Who knows, maybe we will inspire others to clean up the BWCAW next year on National Public Lands Day and every day. Check out our blog for updates and we'll check in following the trip to report our findings. It's Friday, so it's time for a new Science Friday video. "Of the orchid genus catasetum, Charles Darwin wrote: "I never was more interested in any subject in all my life than in this of Orchids." The male flowers in this genus evolved an unusual pollination program. They propel a package of pollen onto the backs of visiting bees. The bees endure the blow (which would be like a 150-pound person getting hit with a few bowling balls) in exchange for orchid aromas that the bees use to attract mates. Buzzketeers, it's a big problem. A ginormous, hulking, frozen, messy problem. See, here in St. Paul, we've had a very snowy winter. 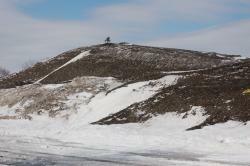 (As of today, it has been the seventh snowiest winter on record. And the snow season isn't over yet.) When the City plows the streets, they have to put the snow somewhere. And one of the places they put it is the parking lot of the St. Paul Saints Midway Stadium, on Energy Park Drive. The 550-spot parking lot is completely -- and I mean COMPLETELY -- covered with snow. It's 30, even 50, feet deep. And it goes from Energy Park Drive north to the train tracks, and from the stadium west to the end of the property. It's impressive, peeps. And here's the problem, friends: the St. Paul Saints season opener is May 8th. And there's no way all this snow is going to melt before then. Baseball needs its parking lot back. 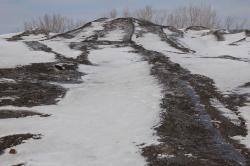 More pictures of Mt. Midway. So how can we get rid of the snow? Trucking it away isn't an option, and minimal use of fossil fuels is a good thing. Buzzers, it's time to go all Mythbusters here and submit your ideas. If you've got a good one, you might get to see it in action. I can’t believe no one has posted on this yet. There is poll running for the weirdest science story of the year. Past winners have included: glow-in-the-dark cats and a 2,700 year-old pot stash, among others. There are lots more. It’s fun reading. Educational to boot!